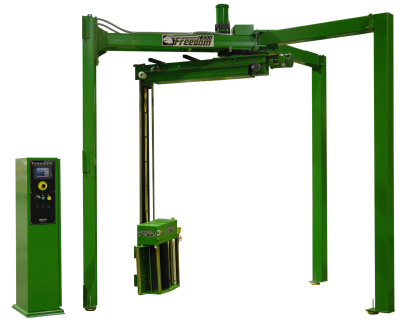 The Freedom 6512 is a semi-automatic rotary arm stretch wrapper. The Powered Pre-Stretch film delivery provides greatly increased film savings and performance with multiple pre-stretch levels to choose from, and the heavy duty construction ensures years of consistent and reliable operation. Automatic and Platform Automatic models are also available. 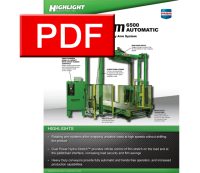 CHOOSE the Freedom™ 6500 for the most advanced rotating arm system available. CHOOSE any film and stretch it to its maximum performance level with Highlight's exclusive Dual Power Hydro-Stretch®! CHOOSE the best, most efficient way to wrap your product utilizing any of five pre-programmed wrapping patterns! The choice is simple. 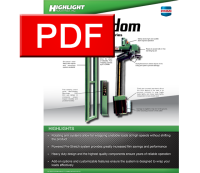 For the most reliable, efficient and technologically advanced rotating arm system, CHOOSE Highlight's Freedom™ 6500!